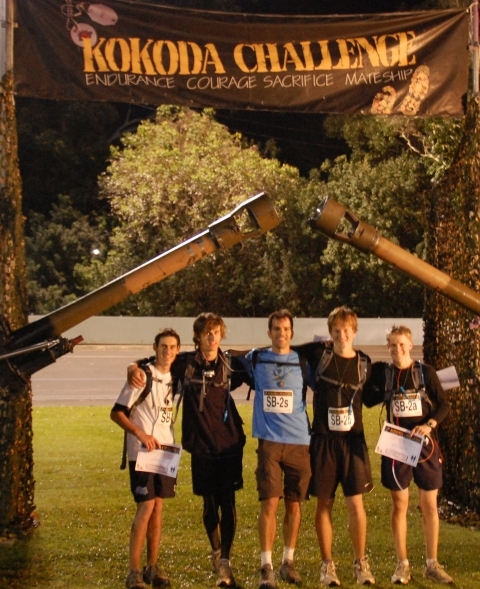 A few weeks back my 2 sons (Jack and Harry) competed in a 5 member school team (4 students and a teacher) in the grueling 96 km Kokoda Challenge. The lads trained very hard for months leading up to the event and were pretty keen to win the school section (there were 66 teams competing). Everything went well on the day and they managed to not only win but they knocked 21 minutes off the old record after a staggering 19 hour 15 minute trek through the bush. Because of the win they were to be awarded the Stan Bisset Cup. Stan Bisset is an iconic Australian – he’s a Kokoda Track veteran, the oldest living Wallaby (Australian Rugby Union team) and has been awarded an OAM for his service to veterans. Jack and Harry read up on Stan and were mighty proud to have won the Cup named in his honour. The boys found out Stan lives on the Sunshine Coast (a few hundred kilometres up the road) and phoned to thank Stan for the inspiration – they were thrilled when Stan invited them up for a visit. Jack and Harry enjoyed a great afternoon with Stan and his wonderful wife Gloria, with Stan recounting many of his war stories and having a long chat. A few days later the boys, along with the rest of the team, were invited along to a reunion of Stan’s legendary 2/14 Battalion to have the Stan Bisset Cup presented by the man himself. To say the team were overwhelmed is the understatement of the year. Good line that one! And true, too. Because the Stan Bisset Cup is a perpetual trophy (meaning it’s not kept forever by the winning team), the event organisers came up with a very neat trophy the boys could keep forever. Today the boys came home from school with a trophy each for the win. 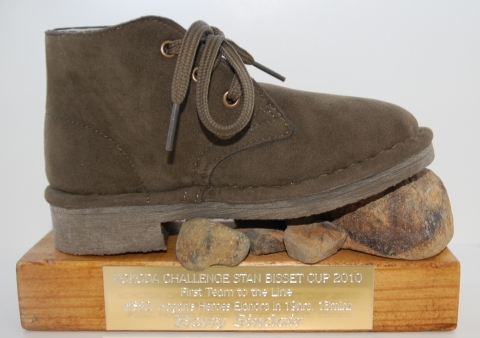 And it’s about the best trophy I’ve ever seen – remembering that it’s for the boys trudging 96 kms in the bush. will take pride of place for years to come. Great stuff by Doug Henderson and the Kokoda Challenge team.